If you watched my Body Shop video the other week then you would have seen I am currently on the quest for the perfect skincare routine. I have always tried to look after my skin but after hitting 33 last birthday I thought it was really time to kick it into gear. The most important thing to remember about skincare is it can be different for everyone. I have normal to oily combination skin but as I am over 30 I also tend to go for anti ageing products too. While I am on this journey I thought I would share the products I am currently using and how I use them. In the morning I start by using Soap And Glory cleanser to wash my face. It smells like peaches and cream and is so nice. I love how quick and easy it is to use so no fussing about and a little goes a long way. I always make sure after using warm water I splash my face with cold to help close my pores. Next I use a large cotton pad, I love the ones from primark because you only usually need one. I use this to apply my toner. 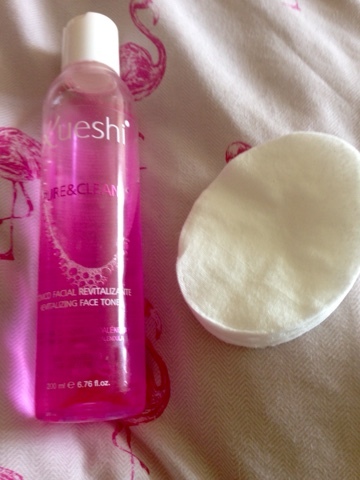 I mentioned this Kueshi pure and clean toner In my favourites video a month or so ago and I love that it smells like red apples. It is so cooling so especially nice to use on hot days and leaves my skin feeling so refreshed. Also hello it's pink! 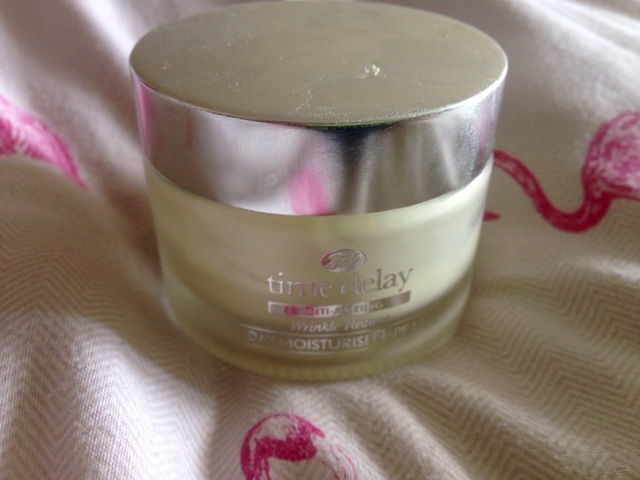 Day cream at the moment I am using Boots Time Delay With anti ageing. It feels so light on the skin but leaves it so soft. However the last few times I have used it I ended up with some in my eye and it really irritated my eyes which I never usually have a problem with for moisturisers. It firms the skin and had a built in 15 SPF. I let this settle on my skin before starting any make up. 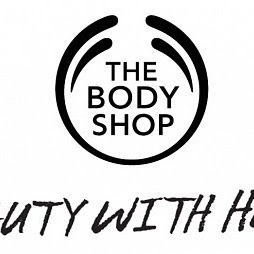 Again a little goes a very long way so this product has really been lasting me making it worth the money. At the end of the day I have become a legend at taking my make up off before bed! I used to always forget and was awful for just using make up wipes which can dry out your skin and not get all the bad stuff off. Now you may have heard everyone banging on about coconut oil being a go to beauty product....well that's because it is. I use it for sooo many things and one of them is to take my make up off at the end of the day. Using a spoon or knife I just take a tiny bit out half a teaspoon at max is plenty. I warm it up in my hands and then massage across my face making sure everything is coming off. Because it is an oil it really lifts all the waterproof products that can be a pain to try and remove. 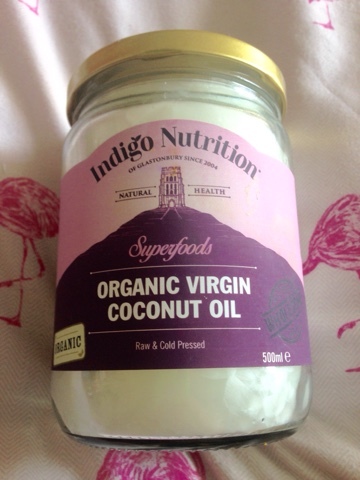 I am currently using Indigo Herbs organic virgin coconut oil which also supports an independent business. If you want to try coconut oil for yourself then enter the giveaway at the bottom of the page. I was this off and make sure I use a warm cloth to get all the product off. To be sure I go back with the peaches and clean lifting any leftover dirt and making sure no coconut oil has been left in my pores. Then bring on the lovely Apple scent of Kueshi. I am not currently using any oils before bed but have my eye on some so I use a night cream. 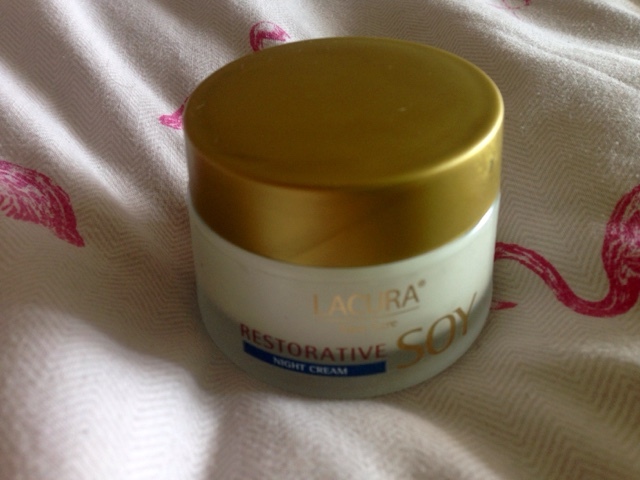 I am currently using Lacura restorative night cream. This was a bargain at only £1.99 from Aldi. Aldi have some amazing beauty products which has won awards so I am working my way through them. I also use a face mask every two weeks to relax and give my skin a kick. I am open to advice and want to hear what you use too!! Now for the competition just chose as little or as many of the options below and some coconut oil from will be winging its way to you! I used to use that S&G cleanser for years back when it was in the pink bottle, but I couldn't find it anywhere after they rebranded! I'm so happy you posted this so I can just go get it again! 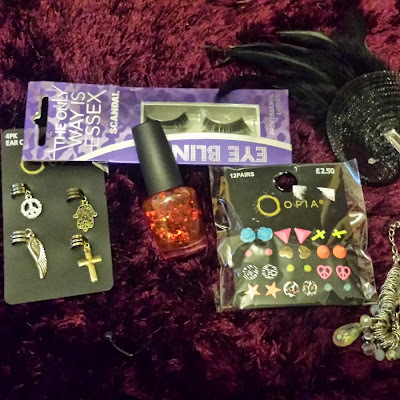 I love soap nad glory products and buy them often as I get discount in boots where they sell them. I love coconut oil it is so good for your skin and I have been meaning to try the Soap and Glory cleanser my friends always rate it really highly. 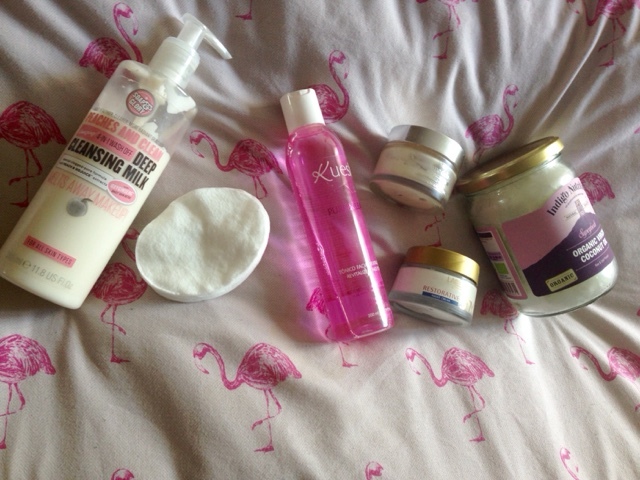 I love soap and glory products but I have not tried any of these before. Lovely giveaway!! I didn't know that coconut oil could help with makeup removal. That's really cool! I may have to try it. I'm the exact same position right now! It's as if a switch happened when I turned 34 in April, my skin went crazy. 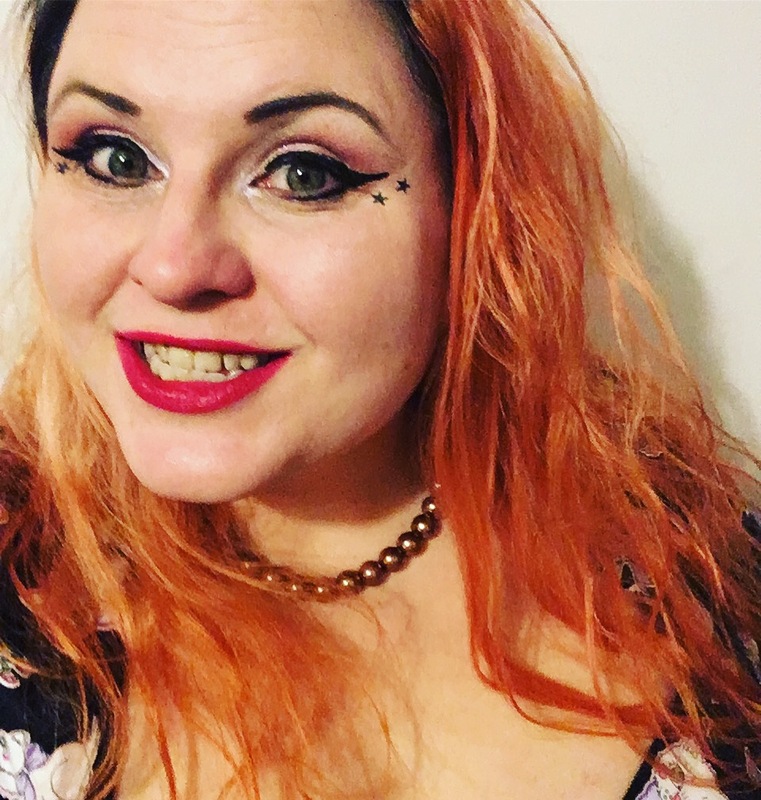 I was a face wipe type of girl now I'm having to put a load of work in, so reading these types of posts is a massive help to me. I alternate my morning cleansers and am currently using Liz Earle, but before that I used soap and glory and it is fab. What a fab giveaway! I need to set up a skin care routine and SOON!!! I love that all the products you mention are so reasonably priced. I have heard so many people say how good coconut oil is for beauty regimes but no one before you has actually specified what they do with it! 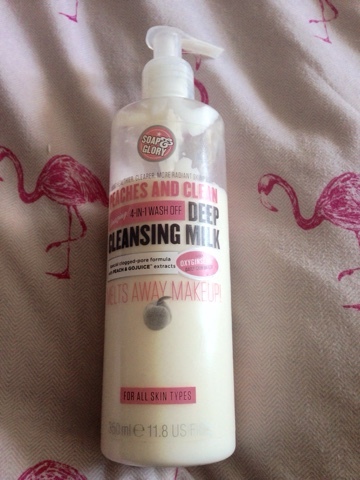 I love the soap and glory peaches and clean cleanser, I use it every day! I'd be interested to try this out as I have two big fat tubs of coconut oil at home that haven't been used. How do you get it to remove your mascara? Bit confused as to how you're rubbing it on your face! This sounds really useful and i need a good cleanser. Thanks for sharing. 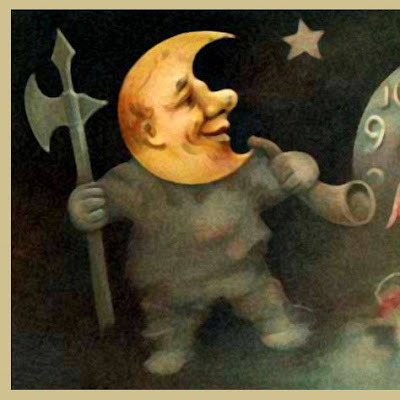 I will have to try it sometime. Oooh! Finally a beauty blogger that uses what I do, I have that soap and glory cleanser! I find that others take too much from my skin and it gets dry, the milk is briliant though! Boots Time Delay With anti ageing sounds like a great product, OMG i do that too as the kids normally distract me so I get creams straight in my ey, duh!!! It's not nice. I've finally got my skincare down. I'm fortunate that I don't need to use too many products. I've used that soap and glory cleanser before! Coconut oil is so good for you- i use it all over- my skin, my hair, my cuticles etc. I'm gonna have to try the soap and glory peaches and clean cleanse. I feel like that would be the perfect way to wake up in the morning. Thanks a bunch.